When Soah’s impoverished, desperate village decides to sacrifice her to the Water God Habaek to end a long drought, they believe that drowning one beautiful girl will save their entire community and bring much-needed rain. Not only is Soah surprised to be rescued by the Water God — instead of killed — she never imagined she’d be a welcomed guest in Habaek’s magical kingdom, where an exciting new life awaits her! Most surprising, however, is the Water God himself…and how very different he is from the monster Soah imagined. Let’s face it – we all get sucked into a soap opera every now and then. Be it Grey’s Anatomy, Dallas, Pretty Little Liars, Revenge or Jane the Virgin, we all have our soapy kryptonite – and sometimes, well, you just want nothing more from life than some ridiculous escapist melodrama. And Bride of the Water God is definitely a series of that very ilk – so, if you’re in the mood for some swoony angst, you have definitely found the right title. Or let me put it this way – when I got one of the volumes out from the library, I found several pages with squares cut out; presumably because some besotted reader couldn’t bear to part with the dreamy pictures of Mui contained therein. (And yes, all the missing pictures were definitely of Mui, aka The Love Interest – I checked, with more than a little amusement, when I checked out an un-vandalized copy.) So yes, this is definitely THAT kind of series. And you know what? I am just having a ridiculous amount of fun reading it. 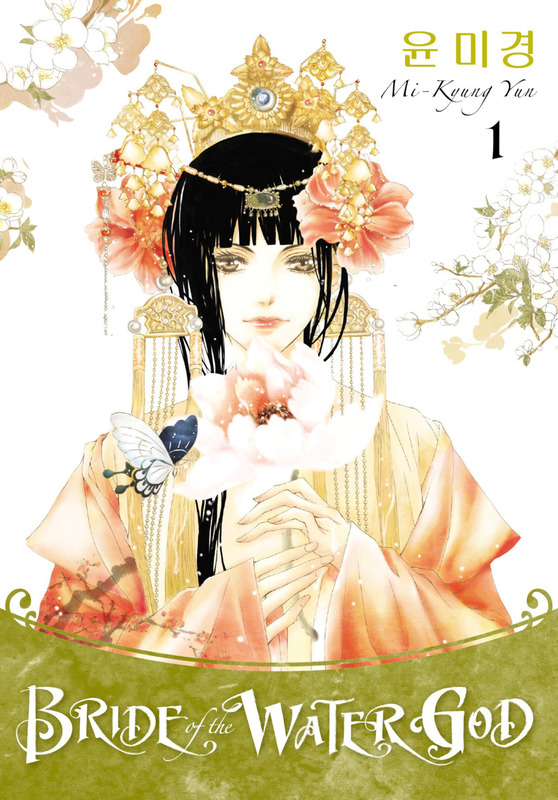 Now looking at the cover, you probably think this is a manga – but technically it’s manhwa, as it hails from Korea. And while I’m honestly not well versed enough in the two to be able to tell them apart, I did find many a familiar story convention in these pages – as I think will any fan of manga or anime. Let’s see – aloof, handsome, rude boy who is secretly sweet? Check. Peppery, gorgeous girl, who constantly is in need of saving? Check. Dramatis Personae of the ridiculously attractive variety, all of whom brood, scheme, and then meddle with rude (but oh-so-handsome) boy and peppery (but oh-so-beautiful) girl? Of course. But wait, do you think handsome boy might secretly fall in love with peppery girl? And that ridiculous plot machinations will endeavor to keep them apart? Ooooh, THE DRAMA. Though I did also really enjoy how this story played on Korean mythology – a mythos gloriously unfamiliar to me – and while I suspect there was subtext that got lost in translation, it certainly provided fertile story ground, as it turns out these particular gods, much like their Greek counterparts, are equally obsessed with scheming, backstabbing, and betrayal. And as the various gods and goddesses quickly queue up to destroy Soah – for reasons romantic, political, and otherwise – it adds a fun backdrop to the romantic shenanigans, as Soah quickly becomes an important pawn in their immortal power games (seeing as she’s Habaek’s weakness). And with a divine war looming on the horizon, powerful rivals are desperate to exploit Soah – and Habaek – for their own gain. So, while it may be a classic paradigm – the mortal caught up in immortal conflict – it’s also a delicious one. Now, is this series perfect? Nope. Does it get progressively more ridiculous with each volume (and there are 16 to date), as the plot kinks and twists and writhes to keep Soah and Mui apart? Absolutely. And admittedly, there is some downright painful stupidity involved at times – such as Soah taking forever to figure out the obvious Habaek/Mui connection, not to mention her being oh-so easily manipulated by EVERYONE; or Habaek embarking on ever more ridiculous measures to protect her – plus there are various plot devices that seem to cycle endlessly, such as the specter of Habaek’s ex – but let’s be honest, tortured romance is the name of this game, and this series certainly delivers it in spades. And while the plot does seem to get lost in its own sprawl at times – particularly as the scope widens to incorporate more immortals and more tortured love stories – it still provides a delicious spectacle, which is more than enough to entertain. So no, this series isn’t perfect – it definitely can be a bit over the top, if not out and out ridiculous – but still, I just can’t help it; I have to know what happens next! Which truly is the mark of any good soap opera – so definitely check this series out, if you’re in the mood. And Twilight, eat your heart out. Rightfully acclaimed in her home country of Korea, Yun received a “Best New Artist” award in 2004. Two years later the public reaffirmed that vote with their own cold, hard cash: Bride of the Water God was 2006’s top-selling sunjeong manhwa. Y’all, Yun’s art is breathtaking. Her composition is dynamic and engaging, with a wonderful sense of motion. Her settings are so detailed you feel as though you could step right into them. And her characters… well, they’re an attractive bunch, to put it mildly. They’re all pretty, with great hair and clothes to die for. The book is a visual feast. Story-wise, it’s pretty good. I did have a little trouble following the thread, but I think that’s mostly because I’m not used to Korean storytelling conventions.